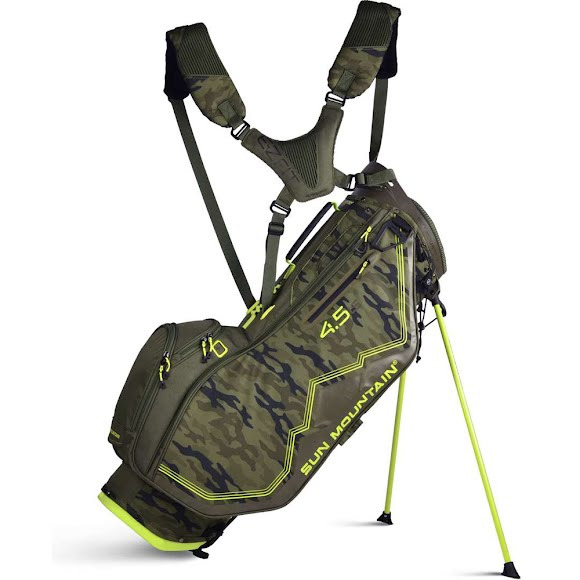 Sun Mountain Sports' 4.5 LS is a lightweight, mid-sized stand bag built for carry and cart use. The E-Z Fit Dual Strap System is comfortable and easy to adjust for a light, balanced carry. Cart-friendly features include a leg lock system, cart-friendly bottom and a cart strap pass-through that allows the bag to be secured to a cart without hindering pocket access. It's the complete package. Sun Mountain Sports &apos; 4.5 LS is a lightweight, mid-sized stand bag built for carry and cart use. The E-Z Fit Dual Strap System is comfortable and easy to adjust for a light, balanced carry. Cart-friendly features include a leg lock system, cart-friendly bottom and a cart strap pass-through that allows the bag to be secured to a cart without hindering pocket access. It&apos;s the complete package.